I recently got a MacbookPro (early 2015) with retina display for work. I installed a fresh Slackware64-current on to it with rEFInd as the boot loader. The process was quite smooth, I used a USB boot image then network install (with a thunderbolt gigabyte adapter). Some devices/functions are not fully functional but usable for me. Console font is using the kernel built in SUN12x22 font with kernel option "fbcon:font=SUN12x22". in .xinitrc file in order to let i3 pick up the correct DPI setting. OK, now the i3 status bar display fine. The default dmenu I initially installed does not support xft font, so it looks really small. Luckily there is a dmenu2 which merged the xft patched. Remove the old dmenu package and install the dmenu2 package, then add the font parameter to the dmenu_run command in i3's config Latest dmenu works with xft font now. Everything works fine. I have the following settings in my .Xresources file.
! low-definition screen, giving a width of $((6*COLUMNS+13)) pixels.
! For xterm menus. This font is large enough, but a bit ugly. 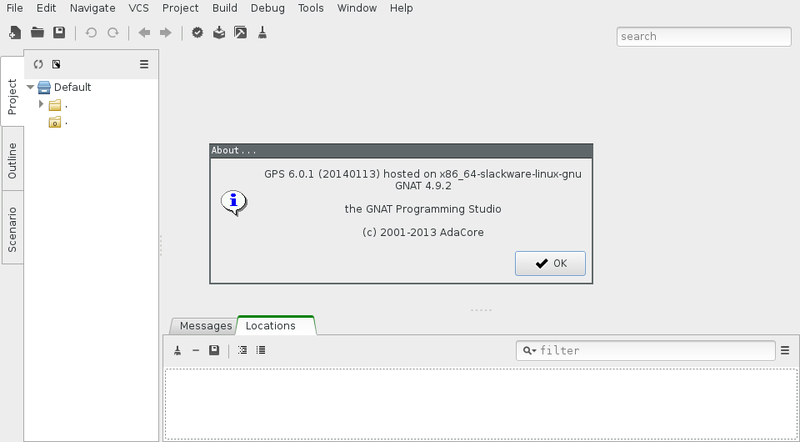 I am not sure whether its GTK3' fault or GPS's fault. I would hope for a GDK_IMAGE_SCALE and only scale image, maybe that will work better. Someone send me a PDF and I could not opened it on my Nexus 5 with Adobe's PDF reader (It suits me the best for a PDF viewer in the android phone). But both XPDF and muPDF under Linux could opened it with some error message saying the xref table is corrupted and try to rebuild it. How could I repair the pdf file? The first tool comes in my mind is pdftk, it failed to read the corrupted file and give exception. Then I try pdf2ps, it failed either. The repaired PDF file is in clean.pdf. P.S. muPDF does not come with Slackware, but it has a SlackBuild script. For Windows user, muPDF provide windows version too. I normally use the GNAT Pretty-Printer gnatpp to format my Ada code. The output of it is not perfect but acceptable and make my code look consistent. I have to manually align the declaration and add specific comments to fence it from gnatpp to change my alignment in future. It does not look good, but acceptable. Wish next version of gnatpp could solve this problem. P.S. Hooray, today (May. 19, 2016) AdaCore fixed the alignment problem. It will properly show up in GNAT GPL 2016. With 13"/14" screen resolution must be high DPI, the higher the better, minimum 3200x1800. Must have optical digital sound output, be it dedicated TOSLINK connector or combo with head phone jack (this has been standard for MacBook for years). Actually, Dell's XPS 13 almost meets the requirement, except for the optical digital sound output. Apple's MacBook Pro comes close but it is not Linux friendly, and screen resolution is lower than Dell's. All of Lenovo's offers lack optical digital sound output, X1 carbon does not have high resolution screen, Yoga Pro does not have enough CPU power. Oh, Microsoft is doing his "smart" again. Now it will silently download Windows 10 image to your machine regardless you want it or not. News from Inquirer confirmed it with Microsoft. This is the content for my previous Getting Started with GtkAda blogs. 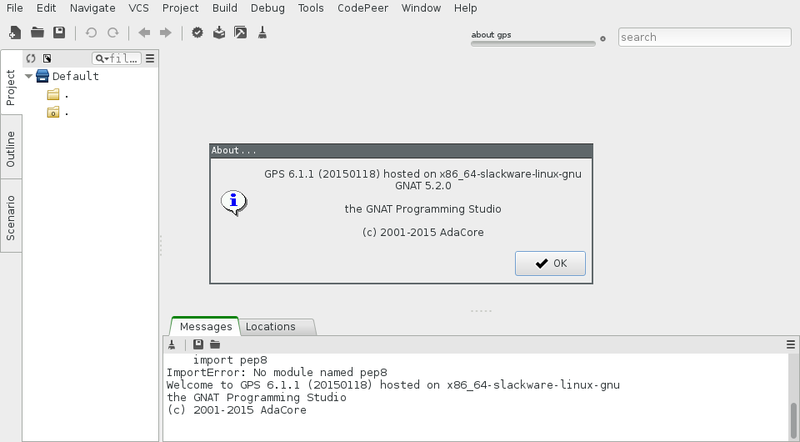 I would like to rebuild the Ada programming environment based on GCC 5 and GNAT GPL 2015 in Slackware64 14.1, as Ada 2012 support is more mature in GCC 5. At the writing, the latest release of GCC is 5.2.0. First I update the build script to matched what's in the current tree. I would to like to replace the stock Slackware64 14.1's compiler with the new one, but GCC changed the default standard C++ library ABI since 5.1.0. To make it compatible with GCC 4, a configure switch (--with-default-libstdcxx-abi=gcc4-compatible) was added to the build script. Also, I have changed the build directory to a fixed location to avoid the random location in the original script. As it is needed for gnat_util build, a fixed location is easier for the script to find the right files. I had problem on i586 platform, which I had to explicitly add the --disable-multilib switch to the configuration and remove the conditional test for it. Built and install without problem. The document build requires Sphinx, as SlackBuilds.org provides all necessary build scripts, it is a matter of installing the relevant packages and dependencies. Further investigation showed that the default target for gprconfig was wrong, it was set to "Slackware" when generating gprconfig-sdefault.ads in my build script, due to not fully understand what it means. After set it to "$ARCH-slackare-linux", it still failed on linking, looking for GNAT's runtime library libgnat-5.2.so, which does not exist for a standard GCC build, as it only has libgnat-5.so. After created a soft link from libgnat-5.so, it builds and working. 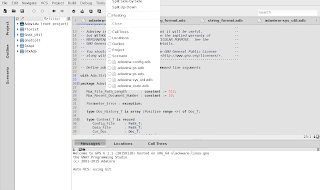 The GNAT Util Library provides access to GNAT compiler internals for AdaCore utilities. The latest release is 5.1.0, since there are no changes on Ada part of the GCC for 5.2.0, it is sufficient for us. The build went well except for the initial gprbuild target problem. After patching the testgtk.gpr with linker option to link with -lX11 -lm, it built and run fine. Aunit's build script needed to adapt to gprinstall command, other than that, it built smoothly. GNATColl compiled OK, with minor problem with libgnarl-5.2.so. 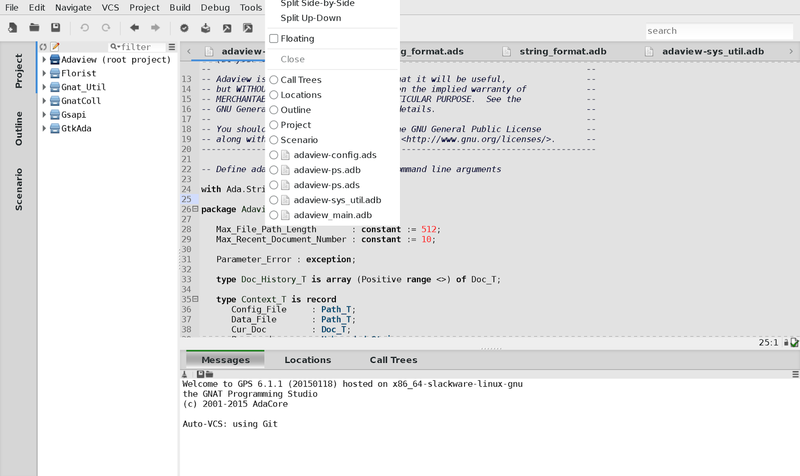 The IDE compiler could be compiled now given all dependencies had been built. The build did not go smoothly related to some xmlada library issues, back and forth a few times, finally got it compiled. When running GPS, it gave python script warning about pep8 and jedi, after install those two from SlackBuilds.org, everything is working fine. The florist library changed to use gprinstall, which breaks the install process. After adjust the build script and patched the Makefile.in generated proper project file for used with others, it built and install fine. Asis has little problem for installing to correct path, some patch needed to be re-do, after that, everything built and installed correctly. Gnatmem gave no trouble when compiled for the 2015 version. Ahven's 2.6 version changed the build process and I had to create a gpr file for it. Other than that, there is no big problems. I encountered the need to access some ssh/telnet/vns server through a client-less HTML5 web app. Gooling gave me the best product and it is free, the guacamole server. Looking at the building requirement of it at, I found Slackware by default does not come with all the components needed. Follow the build procedure in the document, I started with building guacamole-server. I tried to build all the dependency in except for PulseAudio. After look through the supported list of needed libraries, FreeRDP, libssh2, have build script at SlackBuilds.org, and libtelnet does not. After installed FreeRDP and libssh2, I wrote build script for libtelnet, it built and installed without problem. After I had all the libraries installed, I downloaded the server code guacamole-server-0.9.7.tar.gz. The package does not come with a ready to use configure command, and have to use autoreconf -fi to bootstrap it. The configure failed for not finding OSSP UUID library. Slackware already comes with a uuid library from the util-linux package and it is better than the OSSP one. So I developed a patched to use the uuid library from util-linux and it works without problem. Guacamole-client needs Apache Maven to build, and SlackBuilds.org has a script for maven. After installed maven, and with the command mvn package guacamole-client was built and a war file was created in guacamole/target/guacamole-0.9.7.war. I made it install to /usr/share/lib/guacamole/guacamole-0.9.7.war and had it symbolic links to /var/lib/tomcat/webapps/guacamole.war. Now I could saw it from Tomcat's manger GUI, accessing it with url http://localhost:8080/guacamole I got a blank screen :(, that was not good. I have the impression that it should be very easy to setup, now it failed on me. After reading the documentation again, and again, I realized I failed to setup a user-mapping.xml in /etc/guacamole/. After follow the example, voila! it showed me the login page, after logged in, I was presented with the entries I had setup earlier in user-mapping.xml. Links with remote servers are working great! I am preparing SlackBuilds.org scipts to submit, should not wait too long for them to show up. Sometimes I received spam SMS message, and just found out it could be reported to Rogers and get the credit back. For protection against unsolicited and unwanted “spam” text messages, send us a text message with the 10-digit wireless number of the spam message to 7726 (SPAM). We will credit your account $0.15 for each reported SPAM message and it’s free to report SPAM. Premium messages (i.e. alerts, contests and promotions) that you have prompted will not be credited. You will not be charged for administrative (such as roaming, data alerts and service messages) or marketing messages that you receive from Rogers and therefore, those messages are not eligible for a credit. Bloomberg has an interview with Linus, The Creator of Linux on the Future Without Him. Slackware has finally upgraded the system GCC to 4.9.2 in current. Here I presented my work to compile GPS using FSF's GCC 4.9.2. 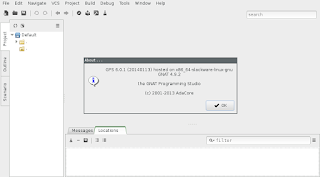 It is based on my previous attempt to build the environment with GCC 4.7.0. This time lots of things have changed, new GCC and GNAT GPL released and they make the attempt much more easier than previous one. 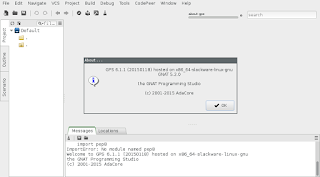 GCC 5.1 has just been released, but Slackware use 4.9.2 in the current branch for now, so we stick with 4.9.2. There is no need to change the build script any more, but we need some of the compiler internal files. So run the standard build script for GCC. For this one, I am using the xmlada-for-gps-6.0.1-src.tgz from GNAT GPL 2014, in stead of xmlada-gpl-2014-src.tar.gz. They are almost exactly the same with minor changes. I am using the gprbuild-gpl-2014-src.tar.gz. GPRbuild expected some support functions that are not in the FSF GNAT compiler. 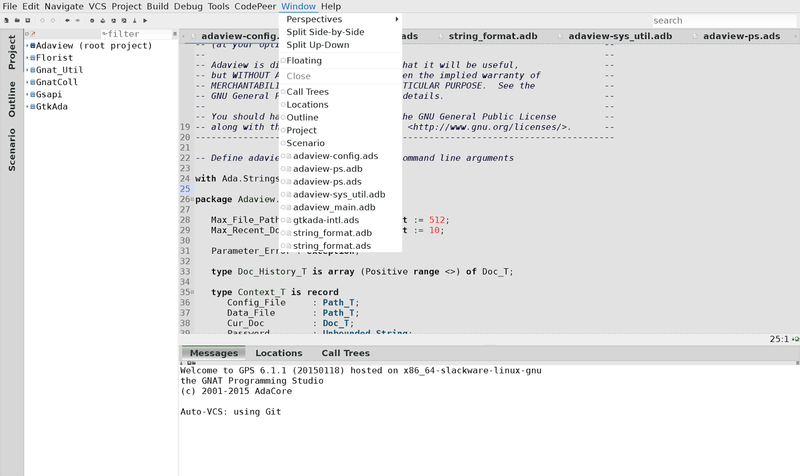 Namely the "GNAT.Rewrite_Data" package and some low level support functions in os_lib.c. 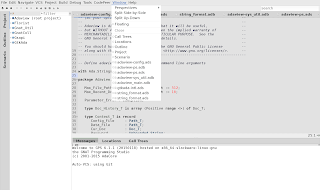 I gather the missing functions from the GNAT GPL 2014 version and make up some packages for it. Then it builds without problem. This GNAT Util Library provides access to GNAT compiler internals for AdaCore utilities. It makes the previous effort of trying to mimic what Debian do redundant. In the build script, the source and build directory of the GCC compiler needs to be specified for it to work correctly. I am using the 4.9.1 one from the sourceforge project. For there is no 4.9.2 version and there are basically no differences for the generation of gnat_util. With the standard gtkada-gpl-3.8.2-src.tgz, there is nothing special, it builds without problem. One may have to note that currently it does not support GL. Aunit GPL 2014 also builds without too much problem. GNATcoll compile without problem with some patches. Oh, finally, we could build the IDE. It depends on pygobject3, which could be build using SlackBuilds.org's supply script. The rests are relatively easy and build fine with the build script. For gnatmem, we need to rebuild the binutils and specified the directory in gnatmem build script. I have tried to build the Ada-RM, GNAT RM, GNAT user guide to integrated with GPS, it seems working for me. A good solution for the problem is here. Simply by putting "(none") under .gitconfig. Then git config user.email in each repository.